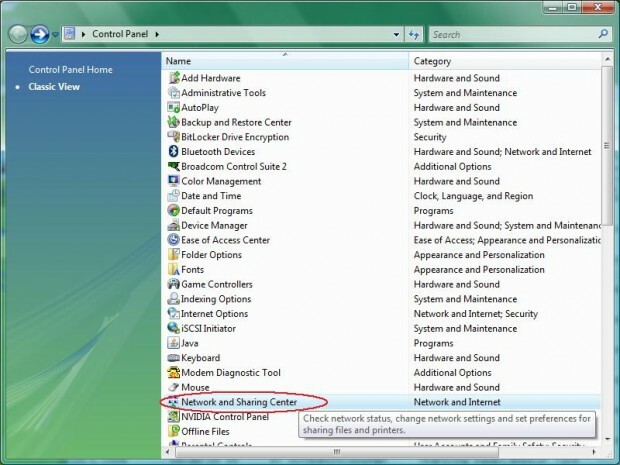 Verify that the wireless adapter switch, if exists in your computer, is set to “ON” . In absence of a built-in wireless adapter, connect an external wireless adapter to the USB port of your computer and wait for the operating system to detect new hardware and install the appropriate driver for it. Proceed when the status “Ready to use” is displayed. From the Start menu (usually bottom left of the screen) select Control Panel, and then open the Network and Sharing Center window. If there is no red X through the connection and the status says “connected to the University of Washington,” your computer has automatically connected to the wireless network and you should verify that the Web browser can access Web pages on the Internet. If the test is successful, no further action or configuration of wireless connectivity is required. If there is a red X, click the link “Connect to a network”. 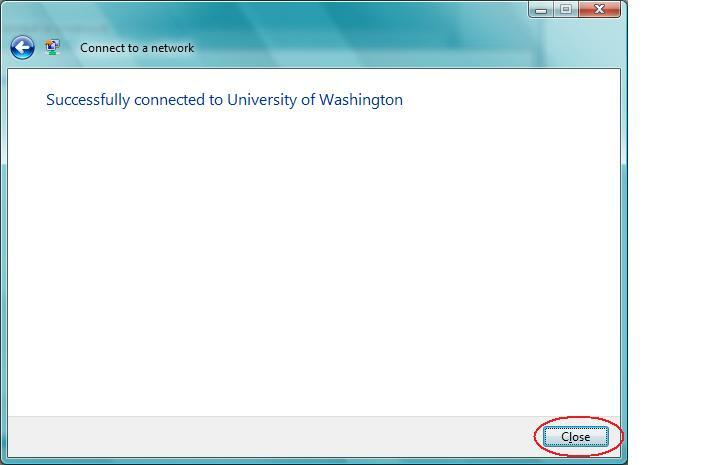 Select “University Of Washington” – Unsecured network, and click “Connect”. If the connection is successful, you will see the statement similar to the one shown on the picture below. Click “Close” to view the final confirmation. 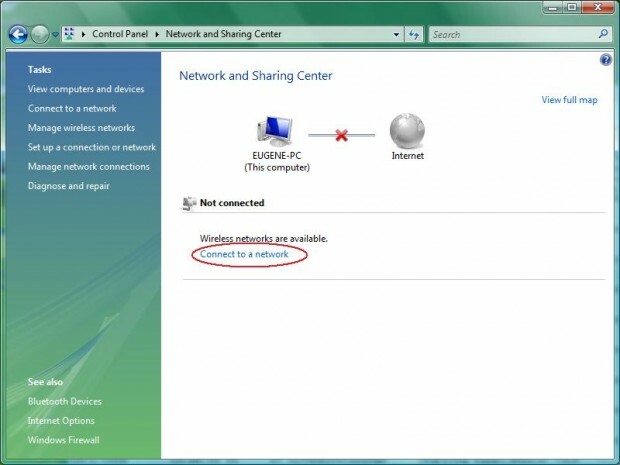 The network and Sharing Center view will now display a normal connectivity to the Internet as shown on the picture below. Normally you will be prompted for personal credentials (UW NetID and password) upon your first attempt to connect to a Web page that is located outside the UW network.The registration is valid for 8 hours. In order to avoid logging in every day, the UW has enabled a Long-Term Wireless Registration. Be sure the Ethernet cable is not connected. Windows will automatically detect any UW wireless access points nearby and will prompt for your decision to connect. For best results, start with the computer turned off, the wireless adapter switch turned off or 802.11b/g/n wireless adapter not plugged in, and no Ethernet cable connected. If using Ethernet, insert the Ethernet cable to the appropriate receptacle in the computer and in the “active” wall jack. Or if using dial-up, insert the phone cable into the appropriate receptacle in the computer and the “active” phone wall jack. Start your computer. 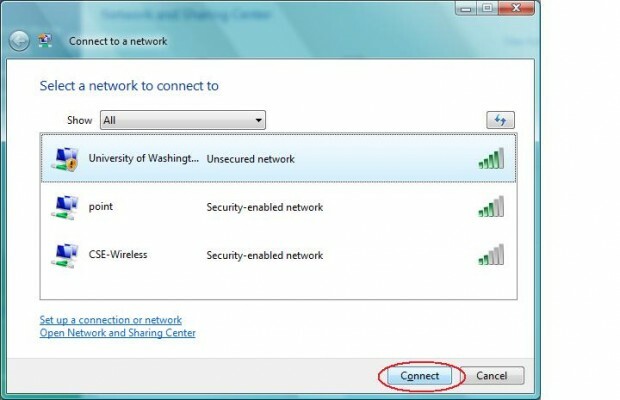 It should automatically start using an Ethernet connection, or allow you to run dial-in networking to make a dial-in connection. To get help or make comments about the information on this page, you can Send a Question to UW Information Technology.